If you are looking for a plant that confirms spring has arrived, Anemone Nemorosa could well be the one. As the weather warms and sun appears it bursts into action. Ferny foliage, wonderful flowers all in a matter of weeks. As spring turns to summer and the shade of the deciduous trees takes over these woodland wonders go back to sleep until next season. Those that recieve a little more light, near the edge of the canopy and a little moisture seem to last longer. A fast growing bulb (rhizome) or plant, Anemone Nemorosa is a hardy woodlander, usually with white flowers that open when the sun shines and close on dull days. 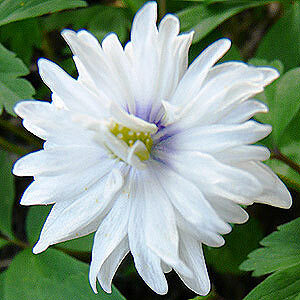 Pictured we have Anemone nemorosa 'Blue Eyes' a very old double clone. Mass planting of A.nemorosa in drifts around deciduous trees and shrubs brings a woodland atmosphere to the garden. 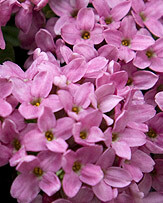 They are also great for early blooms in a shaded perennial border. 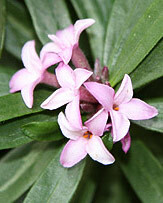 Each flower is about 2cm in size growing above fern like foliage. The foliage dies down by the middle of June. The Wood Anemone grows to around 15 cm high. 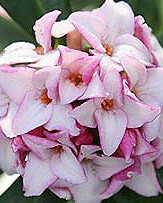 The ornamental flowers are a soft mauve colour underneath. The flowers bloom from March to April before the surrounding trees are covered in leaves, then they become dormant until next spring. This plant covers areas of the garden as long, thin rhizomes spread rapidly at a shallow depth. Anemone nemorosa can be propagated by breaking off small pieces of rhizome and planting in humus rich soil. Plant the rhizome horizontally 2-3 inches deep. Clumps of anemone can be divided every 2-3 years. These plants can also be grown from seed. A.nemorosa enjoy full sun to partial shade and moist soil, although the plants can tolerate drier conditions when dormant in summer. They tolerate most soils and positions. A.	nemorosa 'Robinsoniana' has large pale lavender-blue flowers with rounded petals and yellow stamens. Planted en masse, they are a beautiful addition to the spring garden. This is one of the earliest Wood anemones to flower and will continue to bloom well into April. 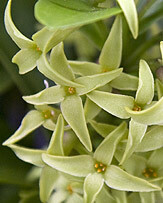 A.	nemorosa 'Virescens' has no petals. Instead it has green bracts that grow above fine fern-like foliage. 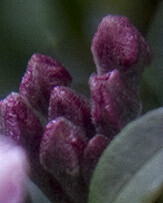 The texture of this plant contrasts wonderfully with other spring flowers in the garden. A.	nemorosa 'Vestal' has beautiful double white flowers with a fluffy centre that rapidly form into clumps making a gorgeous spring display. A.	nemorosa 'Allenii' produces large lilac coloured flowers with a dark pinkish tinge on the outer petals. This is a late flowering wood anemone. A.	nemorosa 'Greenfingers' This plant is sought after for its unusual flower of beautiful white petals with a centre tuft of bright green leaves. The flowers grow above finger- like, ferny foliage. A. nemorosa 'Bracteata pleniflora' produces double white flowers with a frill of leafy green bracts. Quite a vigorous variety. Anemone nemorosa are a great plant for nuturalising in a woodland setting beneath deciduous trees,they require a cool root run so lots of leaf mould and compost is an asset.